Adobe has released a pared down version of Photoshop Elements 9, its consumer-oriented photo editing software, on the Mac App Store. Available immediately, the Mac App Store version of the application costs $80 and includes all the same editing tools as the full version. However, unlike the full $100 version, it does not come bundled with the Adobe Elements Organizer application. This version is available only in English, and cannot be purchased anywhere outside of Apple's Mac App Store. “The powerful capabilities in Photoshop Elements 9 Editor complement iPhoto perfectly, for users who want to take their photos to the next level with advanced compositing and stunning effects,” said Winston Hendrickson, Adobe's vice president of digital imaging products. The omission of the Elements Organizer, a tool for managing images, will not affect users who depend on iPhoto to manage their image library, and is in fact designed to be used alongside iPhoto for more advanced editing features than iPhoto offers. The Mac App Store version of Elements 9 includes the same editing tools that made the full version popular, including content aware-fill, Group Shot, Panorama, and Style Match Photomerge tools. The novice-friendly application offers guided edit modes that walk users though adding effects and cleaning up photos. 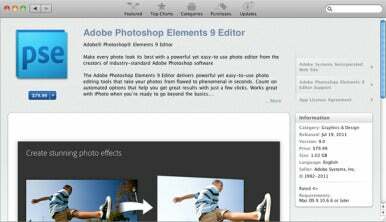 Photoshop Elements 9 was originally released in September 2010. It retails for $100 at the official Adobe store, but can be found in various other venues for as little as $80. The 1.02GB application is available for download now and runs on Intel Macs running 10.6.6 or later.